2Wheel Chick: Knobblies, Grass, Mud, Dips, Banks, Planks - Cyclo Cross is ON ! Knobblies, Grass, Mud, Dips, Banks, Planks - Cyclo Cross is ON ! It's that time of year when you feel less worked up about your racing. You turn up an hour or less before your race. You enter on the line. You're not that pushed about sizing up or psyching out the opponents. Then your off. One hour of high intensity racing, over narrow dirt tracks, weaving through the trees, dropping down dips, up over steep banks - sometimes carrying your bike. Then you've gotta leap over planks of wood - the special ones can bunny hop them, while us lesser mortals are compelled to dismount to haul body and bike over them. All done on a "road" style bike with knobblies (even a cyclocross bike !). Sometimes done in thick, sticky mud. Anything can happen. You might be dropped, but then your opponent may pack in due to a mechanical. You might even get stronger as others blow up. Or your opponent might fall down the banking, never to be seen again - at least for the next 45 minutes ! After an hour you finish. You're all sweaty and salty - fatigued, but with a big smile on your face. knowing that you took up the challenge as best you could. You may not have finished as high up the field as you wanted, but who cares, you had fun and did something to maintain your autumn/winter fitness ! That's Cyclo cross - it's on from now until February, and I love it ! It's the one type of cycling where I have fun regardless of how well or badly I do. I get to make new cycling buddies as we meet up for the weekly battle in school fields, parks and woodlands, of the South East. I don't get pre-race nerves like in road races. I don't worry about how/when I'm gonna get fed like in cyclosportives. I'm not even that bothered about crashing, as you generally fall on something soft. It's pretty care free compared to what I do during the Spring and Summer months, and it's the best way to get me out on my bike when it's cold and dull outside. In fact the purists may argue that it's not cyclo cross unless it's cold, and rainy - or at least full of thick mud ! 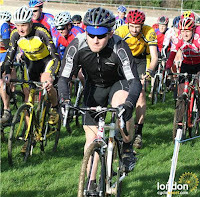 I've done the first couple of rounds of the London Cyclo Cross League. Both of them took place in glorious sunshine and on dry terrain. That probably explains why I rode relatively well (Two wins in as many weeks.) ! The next one, at Deers Leap Park, East Grinstead may be a different matter. This course is known for being pretty wet and sticky, so it'll be interesting to see how my road racing fitness will fare in these conditions. It's been great to be the ladies' winner the last couple of weeks. However, I know I will be put in my place when the fast girls turn out at East Grinstead and future rounds ! Either way, I look forward to it and I'm sure it'll be a good craic ! 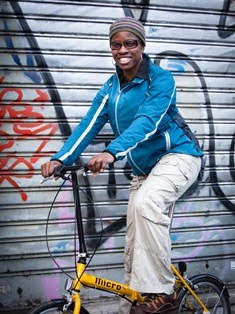 I was going to give cyclocross a crack this year and everyone's been raving about it. But I can't justify the new frame and bits as I've just splurged on a new SRAM Rival groupset for one of my road bikes. If I get an ebay bargain before christmas I'm there though as it sounds like a blast.